The Democratic Republic of Timor-Leste, commonly known as East Timor (Tetum: Timór Lorosa'e), is a country in Southeast Asia. It lies northwest of Australia in the Lesser Sunda Islands at the eastern end of the Indonesian archipelago. Timor-Leste includes the eastern half of the island of Timor, the Oecussi (Ambeno) region on the northwest portion of the island of Timor, and the small islands of Atauro and Jaco. 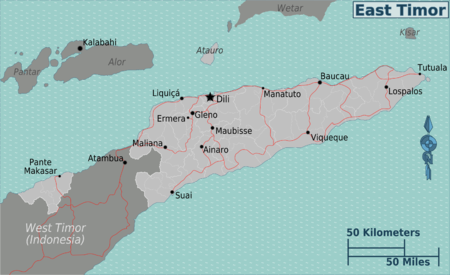 On 20 May 2002, Timo-Leste was internationally recognized as an independent state under the official name of the Democratic Republic of Timor-Leste. UN peacekeeping forces remained and a large number of Non-Government Organizations (NGOs) began operating. In 2012, UN troops were officially withdrawn and east Timorese police and army took over any military installations. Although there are still NGOs working within the country, their numbers have been steadily declining over 2012. Timor-Leste has a hot and humid climate (tropical). November to May is the wet season with the temperatures averaging 30ºC the year round, with temperatures far cooler in higher altitude areas. The dry season lasts for about 6 months during June to October. Visa free Nationals of all European Union countries may enter Timor-Leste visa-free for up to 90 days in a 180-day period when travelling for tourism purposes. Indonesian nationals may apply on arrival at any border post, including land border crossings as well as Dili International airport and Dili Sea Port. General conditions Aside from holding a passport valid for not less than 6 months from the date of entry, all travellers also should meet these conditions to be allowed entry to East Timor. Provide evidence of accommodation arrangements and a return or onward ticket. Provide evidence of sufficient funds: **US$150 per day for tourist or business visas. **US$100 plus US$50 per day for transit visas. However if you are holding a passport from a wealthy country, and look presentable, the immigration officials will not ask for any of this, and will simply take your $30 and pass you a visa sticker. You then queue up at passport control, who will put the sticker in your passport. Visa extensions Extension after arrival is possible – at a cost of US$35 for each extension of 30 days, or US$75 for extension of 60 days. Extension of a tourist visa beyond 30 days requires a sponsor, East Timorese citizen or work-permit holder, to complete a Termo de Responsabilidade, guaranteeing your conduct and compliance with East Timorese laws for the duration of your stay. Many choose to avoid this hassle and fly round-trip to Bali to get a new visa-on-arrival. Check out the Immigration Department of East Timor , and specifically the link to the Tourist Visa  for details on visa requirements, and for details on how to apply for a "visa application authorisation" (which may be obtained via email before you travel), or how to apply for a visa at an Embassy or Consulate should you want to enter at a land border crossing. Sriwijaya Air and its sister company NAM Air  from Bali (Denpasar), Indonesia. Citilink  from from Bali (Denpasar), Indonesia. It is cheaper to book separate tickets from your origin to Bali / Singapore / Darwin and then purchase separate tickets to/ from Dili, rather than book a through ticket (which may show up as Hahn Air or similar on booking websites). Return tickets are usually the same price as two singles, so don't feel you need to book a return flight. For the Indonesian airlines you can try Nusatrip or Tiket.com to ease the booking process (there is less chance of your credit card being declined using these services). For tickets originating in Dili, it can be a little cheaper to buy from one of the many travel agents in Dili, paying in USD, than to book on the internet. You will also be helping Timor's small businesses this way. Whilst you can check baggage through Singapore to a connecting flight, you will need to collect and re-check baggage through Bali or Darwin, unless perhaps if you are connecting with the same airline to another destination in Indonesia / Austrailia. Sriwijaya Air and its sister company NAM Air from Bali (Denpasar), Indonesia. Both airlines have one Daily return flights from Bali. The main land border crossing with Indonesia is at Mota'ain (or Motain), 115km west of Dili. The nearest Timor-Leste town is Batugade, 3km to 4km away. The nearest Indonesian town of consequence is the West Timorese town of Atambua. There are also land border crossings at Salele (near Suai) on the south coast, and into Oecussi at Bobometo (north of Kefamenanu on the Indonesian side) and Wini on the north-east coast of Oecussi. Visa on arrival is not available at the land border for most visitors apart from Indonesian and Citizens of Schengen countries. See the Immigration Department's Tourist Visa link  for details on how to apply for a "visa application authorisation" (which may be obtained via email before travel) or how to apply for a visa at an Embassy or Consulate should you want to enter at a land border crossing. 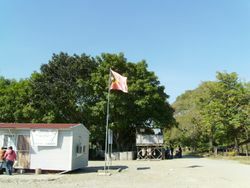 If you have a valid Timor-Leste work permit / exemption certificate you can enter Timor Leste freely at the land border. There is an Timor-Leste Consulate in both Bali and Kupang where you should be able to purchase visas. The same problem can exist in the other direction -- although as of 2016 the Indonesian authorities, in a bid to promote tourism, allow free visa-on-arrival at land borders, including with Timor Leste. Rules and policies can change however, so it is best to check the current situation when you are in Timor Leste. Getting a visa at the Indonesian Embassy in Dili is possible; it takes one week to issue a 60 day tourist visa (return flight not needed!) and it costs US$35. Travelers have reported problems doing a visa-run to Indonesia from Timor Leste (so to get a new Timor Leste tourist visa), you may need to stay overnight in Indonesia to keep the Indonesian border guards happy. There is a direct bus service daily between Dili and Kupang in West Timor, Indonesia. Journey takes 12 hours. There are many land travel minibus services to cater for individuals or groups travel from Dili to Kupang (West Timor) and return. Timor Travel, Paradise Travel, Leste Oeste Travel are few of the minibus companies that provide travel services to several different destinations along the Dili-Kupang route at a very affordable prices. Check the current situation on getting an Indonesian visa-on-arrival for your nationality before you leave Dili for the border. The Indonesian embassy only processes a small amount of visa applications each day, on a first-come, first-served basis. You may need to queue at the embassy in Dili at 3am to have a chance of getting a visa. Timor Leste is on a handful of cruise ship itineraries, P&O Cruises, Holland America Line, Noble Caledonia and Paul Gauguin Cruises have Timor Leste on their itineraries. In Dili, you can hail a ride on a mikrolet for 25c to get around. The mikrolets are numbered, and each number goes on a set route. To get off, simply tap your coin on the metal handrail and the driver will stop for you. You pay the driver when you get off. Mikrolets, buses and "angunna" (truck with open-air back for passengers) are your main means for getting from one district to another one. Most of these departures take place very early in the morning and drivers have a tendency of doing keliling (Indonesian for "going round") where they spend considerable time combing the streets and scouting for passengers before actually departing. From Dili to other Districts. Fares range from US$3 - US$10 depending on distance. Taxis are one of the best means of transport in and around Dili. There is two types of taxis in Dili. Yellow ones are typically old ones and have no meters. Fares are not very steep ($1-3) and there are lots of them! However, you do need to negotiate the price with the driver first before hopping on. There are few taxis in the evening so do expect an extra $1-$3 more on your trip, especially if it's really late and your destination is far. In night time women should not use Yellow taxis alone because of risk of harassment. Since 2016 there is also a few blue taxis. They are run by Corotrans. These taxis are newer cars and they charge by meter. In general blue ones are more safe. Blue ones are harder to find, but you can try to call them. Number is 7742 7777 / 331 1110 / 7724 1156. It helps if you talk Tetun or Bahasa Indonesia. You can hire a vehicle (Saloon or 4WD) in Dili for around $85-$120 a day from Rentlo or other companies . However, do be prepared for adventure - besides the tricky roads there is the lack of road signs to contend with. It is possible that you will get so caught up with driving that you miss out the great scenery around you. Regular domestic air services now exist to/ from Dili to Oecusse, and Dili to Suai. There are no regular flights to Baucau. "STAT" (below Burger King at Dili Airport) operates these routes, it is best to check with them in person on flight schedules / costs / bookings. There is also the possibility of flying to Atauro with small MAF planes that can be chartered. Motorcycles/scooters are a great way to see the country: you'll be afforded the freedom of traveling wherever you want at any time, and will have a rather small responsibility in terms of a bike to park over night. Bungee cords may be purchased from Star Moto in Baucau to fasten your luggage to the bike. 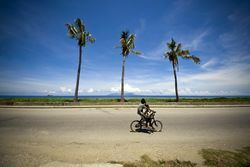 Motorcycles can be rented from Dili Central Backpackers for $25/day. Tourists in Timor-Leste are a rare breed. Simply traveling from village to village, you're likely to hear choruses of "malae" (the Timor-Leste word for foreigner) and folks will want to engage you in conversation. One could spend several days just enjoying the feeling of being a very welcome stranger. Timor-Leste is located at the end of the Indonesian archipelago, north of Darwin, Australia and at the base of the Coral Triangle, which hosts the highest diversity of coral and reef fish species on earth. Timor-Leste offers a rich cultural heritage spun from tens of thousands of years of human habitation, the Portuguese and Indonesian colonial periods, and from the depths of a society which has cultural traditions as the fabric of that bonds society together. Timor-Leste is well positioned for community-based ecotourism, which has been written into the nation’s tourism strategic plan. The Nino Konis National Park (situated in the eastern part of the country) is a well protected area and considered as some of the last surviving zones of tropical lowland rainforest in the world with rich coastal environment. The national park accommodates bird-watching, diving, trekking and pre-historic archeological sites. For more adventurous tourists, Timor-Leste offers what is simply world class trekking, which can be experienced near places such as Mount Ramelau (± 3000 above sea level), Ainaro, Mt. Matebian (Baucau) and Mt. Kablaki (in Same district), to name a few. While trekking Timor-Leste, you can keep busy by looking for some of the 260 species of birds on offer (the entire continent of Australia has some 650 resident species), 32 of which are endemic and 8 of which are exclusive to the island of Timor and found nowhere else in the world. For example, the Timor Bush Warbler was recognized as a distinct species as recently as 2001 and it is likely that the elusive montane species can be found in the hills of East Timor. The Bush Warbler is one of the many endemic birds that will be the focus for intrepid birdwatchers coming to TL. Portuguese fortresses, churches and other monuments are scattered throughout the nation. For history enthusiasts, Timor-Leste's resistance tourism which worth exploring are the Xanana Gusmao’s (current Prime Minister of Timor-Leste) hiding place, Balibo (known for the killing of 5 journalists by the Indonesian soldiers), Santa Cruz (known for a massacre in 1991), Japanese caves in Baucau and many more. Coffee had been the main export commodity for East Timor since the colonial period. To visit East Timor is to taste its coffee grown in several regions such as Ermera, Maubisse, Manufahi and Liquisa. Travel to the coffee plantations takes you through winding mountainous roads, until over 1,000m above sea level altitude, cool climate (as low as 15C), and greeted by smiling farmers who are more than willing to welcome you to their homes. Other alternative is to contact one of the organizations dealing with coffee for a field visit to their cooperative farmer member's coffee plantation. They are: CCT/NCBA, ELSAA Cafe, Timor Global, Timor Corp, Peace Winds, PARC-IC and Alter Trade Timor. Timor's coffee is now well known across the world and amongst organic coffee drinkers. It is now even sold in Starbucks Seattle as 'Arabia Timor' brand. Several organizations are promoting East Timorese coffee as Fair Trade Coffee in U.S., Japan and South Korea. One Japanese coffee expert praised about Timor's coffee as, 'one of the remaining original species in the world today.' (Horiguchi-san, 2005). Timor-Leste also produces various types of woven textiles and products for export and unique souvenir. High end and expensive tais ( Timor-Leste traditional hand-woven textile) are made from nature-produced colors, while more economical textiles use chemical dye. 13 districts in the nation produce distinct design and colors to another. 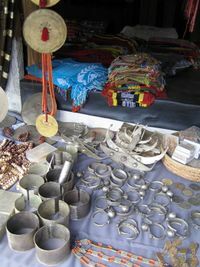 Tais markets are available in Dili; however, for antique collections, one must visit the districts. Timor-Leste has some of the best scuba diving in the world, and this is a major draw for tourists with East Timor shore diving becoming known worldwide amongst the diving community. Pristine beaches and coral reefs stand in stark contrast to one of the poorest populations on Earth. Without a doubt, Atauro Island is East Timor's most pristine diving area. Around the island is a large variety of dives suitable for every level! Visibility is always excellent, and the abundancy of fish life and coral is simply overwhelming. For beginner divers, The East Coast of Atauro Island sports sheltered inner reefs and gently sloping outer reefs in which to explore some of the worlds most diverse and densely packed marine life. Intermediate divers will revel in the sandy bays and densely packed walls of the West Coast. For the more adventurous, diving opportunities include dramatic walls on the West, big pelagic encounters in the South, Deep slopes on the East, critters all around and some of the regions best drift diving. There are 2 dive companies in Dili that specialize mainly in local and East Coast shore diving: Dive Timor Lorosae and Aquatica Dive Resort. There is 1 dive company who specialize in the above as well as dive, snorkel, and whale/dolphin watching trips to nearby Atauro Island and further afield to Jaco Island: Compass Charters & Ocean Adventures. In general all dive operators in Timor-Leste operate to a high standard. However, it pays to check the quality of rental equipment and also enquire about the qualification and experience of the guides that you will be diving with. Dive Sites of Timor-Leste contains detailed descriptions of most popular dive sites, with links to maps and scuba resources, provided by long-time divers in the country. The US dollar ($) is the legal tender in East Timor - all transactions are in dollars. Banks and ATMs can be found in Dili. East Timor issues coins denominated in centavos and are not the same size as U.S coins, although U.S. coins are widely accepted. If you are from a country or territory with the US dollar as a official currency, you will not need to worry about understanding prices and currency transferring. Also if you are from Bermuda, Panama, or Bahamas, the official currency(ies) of the mentioned countries and territories have fixed exchange rates to the US Dollar. Meaning what price is said in East Timor will be understood with your country's/territory's official currency. Example; $150 US Dollars will equal $150 Bermudian dollars, but you will still have to exchange currencies. Aromatic coffee beans and colourful hand-woven cloth called Tais are the two items that should be on your must-buy list when shopping in East Timor. All convenience stores and even some roadside stalls sell excellent coffee. Just as Scottish clans have specific patterns for their tartans, families in East Timor have Tais in specific patterns and colours. Roasted coffee beans will be a great gift item. Note, some countries have strict rules about importing any food item. Timor-Leste coffee is grown organically and tastes fabulous. Coffee was introduced in East Timor by the Portuguese. The local way of making coffee is to roast the coffee beans till they turn black and let out a great aroma. Low acidity levels ensure the excellent taste of East Timorese coffee. Timor-Leste, like the Indonesians, have a staple diet of rice and spices. The East Timorese palate includes a taste for several international cuisines in addition to the traditional Timor-Leste cuisine. Portuguese, Indonesian, Chinese, Italian, Western, Japanese and Thai cuisine have made their presence felt in Timor-Leste. Significant numbers of foreigners living and working in East Timor ensure a loyal clientele for these restaurants. The staple food in East Timor is rice. Commonly grown food crops include taro, cassava, sweet potatoes and maize. Beans, cabbage, cowpeas, onions, tomatoes and spinach are well-liked vegetables. People also rear poultry, goats and pigs. Fish forms an important part of the diet and acts as a supplement to any meal. Most traditional East Timorese recipes use a generous dose of spices. Mangoes, watermelons, papayas, bananas and coconuts are the most commonly cultivated fruits here. Carbohydrates like sago or other grains form the main dish for many a East Timorese meal. Fried fish is a very popular dish, with prawns being considered a delicacy. Curries are a standard dish, with chicken curry topping the list as a favourite. Several authentic Indonesian, Japanese, Portuguese and Chinese dishes find favour with many Timor-Leste. Coffee is grown organically in Timor-Leste and the level of caffeine in this variety is very high. Those looking for something other than coffee can have beer, which is widely available in both pubs and restaurants in East Timor. Bills presented in East Timorese restaurants do not have a service charge added to them and tipping is not mandatory. If you feel like tipping, you can tip 10% as a guide. Dili Central Backpackers offers the best value accommodation in the capital with a wide variety of rooms to suit all budgets. The starting rate for a room in a dorm with a fan is $10/night. Outside of Dili, hotel options are limited but can there is usually at least one in each of the more visited areas. The Island of Atauro has many hotels to chose from. There are plenty of creative options if you don't insist on luxury, and these range from guesthouses to convents to camping. There are hospitals in main centers, and clinics in many sub-districts elsewhere but medical care is not up to dealing with sustained or complex medical emergencies. Medical evacuation is often the only option in the case of complex surgery, trauma, or major illness. Travellers are strongly advised not to enter East Timor without some form of medical insurance which will cover medivac by air ambulance, be this travellers insurance from your travel agent or an employer if you are entering for professional reasons. Timor-Leste was devastated by the Indonesian occupation that may have killed up to 200,000 East Timorese (or 1/5th of the population). Many East Timorese were forced to abandon their traditional animist beliefs for Roman Catholicism to integrate as part of Indonesia, as Indonesia does not recognize traditional beliefs. Remember this sad fact when dealing with the East Timorese as the occupation will probably not be a distant memory for those who hold it. Speaking well of Suharto's Orde Baru or of the idea of East Timor becoming part of Indonesia may not be well received by the Timor-Leste people. Many East Timorese are sympathetic or even outright nostalgic about the period of Portuguese rule over Timor-Leste, where they were generally left to their own devices by the Portuguese colonial government. As with discussing politics abroad in all places, if you aren't sure a discussion about sensitive topics will go over well, don't bring it up. There may be possibility of work related to agriculture. A good starting point may be to find and contact NGOs working in the country. Timor Telecom  had a monopoly on landline phone services in East Timor. With mobile phones there is three operators: Timor Telecom, Telemor and Telkomcel. All mobile operators offers packets where phone calls to same operator are cheap or even free. For example Timor Telecom gives you 300 MB internet, unlimited phone calls and SMS to another Timor Telecom numbers for $1 USD per day (October 2017). You activate packets by SMS or by USSD codes. Phone calls between operators are relatively expensive. It is recommended that you buy a local prepaid sim card for US$1 on arrival from any Timor-Telecom store (there is one in Timor Plaza  on way into town from the airport). Local prepaid SIM cards can also be purchased from street peddlers but sometimes at a higher price. Once the prepaid sim card is activated, you can top up the credit by purchasing "Pulsa" top-up strips from street peddlers. Please remember that whilst international phones work in Timor-Leste, the global roaming fees are very hefty, hence the recommendation to purchase a cheap phone package, even for a short visit. On 31st July 2012 the National Numbering Plan (NNP) was changed and all mobile phone numbers now require an additional '7' be added to the front of the number making a total of eight digits. Land lines remain unchanged. Internet in Timor-Leste is changing rapidly. Internet used to be extremely expensive and some services - such as VoIP phone calls - was blocked by operator. Since new operators - Telkomcel and Telemor - entered to the market prices have come to reasonable levels. You can get 1 GB internet package for $5 USD or unlimited internet usage for 24 hours for $1 USD. Typically unlimited packages are very slow and unusable for VoIP or video streaming. First 4G networks are build in 2017 in Dili.